The compact and elegant Kettler Unix P elliptical trainer is the company’s latest winner of the coveted Plus X award for Innovation and Design. This mid-price Kettler model is exemplary for its effortless glide and natural stride motion. The high resolution backlit LCD display provides feedback for speed, RPM, time, distance, energy consumption, pulse rate, and brake level. This display also shows a graphic 375-dot matrix for program hill profiles plus a scan function to rotate feedback in the window. 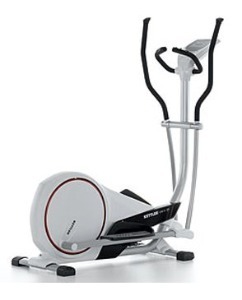 Unit wt/dimensions: 142 lbs/ 57" x 23" x 60"
The motorized 45-lb flywheel and Ply-V drive belt on the Kettler Unix P elliptical trainer is frictionless for an ultra smooth and quiet workout. The crosstrainer has a listed 16" stride but it is actually a 19" measurement along the elliptical path. With its 142-lb high carbon steel frame, the Unix P is solid enough for users up to 330 pounds. Other features include sealed ball bearings at every pivot point, 15 levels of variable magnetic resistance, and a “Q” factor (spacing between pedals) that measures a comfortable 7.5". For the heart rate control programs, you can use the contact grips on the handlebars or the earlobe sensor accessory. The console is also compatible for use with a wireless chest strap (not included). If there are any drawbacks to the Kettler Unix P elliptical it would be that some users mention in reviews that they find the blue backlit display to be a little confusing and hard to read. The Kettler Unix P has been showered with awards and kudos for its outstanding engineering, design, and a performance that is described as smooth, fluid, and ultra-quiet. At just $1,299 it is reasonably priced for what you get. If you would prefer to save a little money and still get a Kettler, check out the Unix M, with a battery-powered console and a 40-lb flywheel; that sells for $200 less than the Kettler Unix P elliptical trainer. Both are rear-drive models and should be compared head-to-head to see which delivers just the right combination of features you are looking for.